Today started as a bit of a mess. That happens when I sleep through my alarm, seeing as how I move just above glacial in the morning. Even after I got the kids to their schools with their haphazardly thrown-together lunches, I was still operating in more of a lopsided out-of-sorts version of myself. I knew what the menu said would happen for dinner tonight so I got out my crockpot and started throwing the ingredients into it. And then, just as I was about to put the lid on the whole thing, I sniffed. It isn’t that I smelled anything wrong. But I didn’t smell anything right. And so let me tell you a wee secret. Especially when using a crock-pot, slow down for the holy trinity of cooking, even if it means you have to eat a banana for breakfast and drink your coffee in the car. Your dinner tummy will thank you. Now, in case you don’t have a clue what I’m talking about here, let me explain. What is the purpose of a crock-pot? If you answered a time-saving meal-making device, I’ll give you partial credit. But only partial and that’s because you are forgetting about what happens when you use a crock-pot. Hours later when the day has knocked the wind from your sails and you walk in your front door, you are greeting by the smell of comfort. And that is why we use crock-pots. To make the coming home feel like a big hug instead of yet another chore awaiting us. If you don’t believe me, just think back to how many times you’ve gotten take-out or fast-food simply because you’re too pooped to pop and the thought of having to make something healthy to eat makes you want to cry. If you are making something in the crock-pot, you can’t do what I narrowly escaped doing myself this morning: failure to prep. Preparation requires two things: getting good ingredients before hand and then making them start out in the best possible manner before plugging in that crock-pot and walking away for 10 hours. Today I am making a version of Swiss Steak. What I did while thinking about stripping beds of sheets and vacuuming is take my cut of beef, wash and pat it dry and place it in the crock-pot. Then I roughly chopped an onion and added it and a spoonful of minced garlic. I opened a large can of diced tomatoes and threw that in with half a can of water and some spices. Then I turned on my crock-pot and started to put the lid on. And stopped. If I had just walked away, dinner tonight would be fine. But it would lack the benefits of the holy trinity of cooking (the French call it mirepoix and the Italians call it soffrito) as well as the layers of umami that raise a dish from fine to comfort foods. So I sighed and shook my head at myself. How could I have been so silly as to be so distracted by the minutia of Monday that I nearly made a “okay” dinner instead of a what I figure my family will more likely ooh and ahh over? Then I pulled my beef from the mixture and washed it off, dried it again and then seared it on both sides in a pan heated with some olive oil. 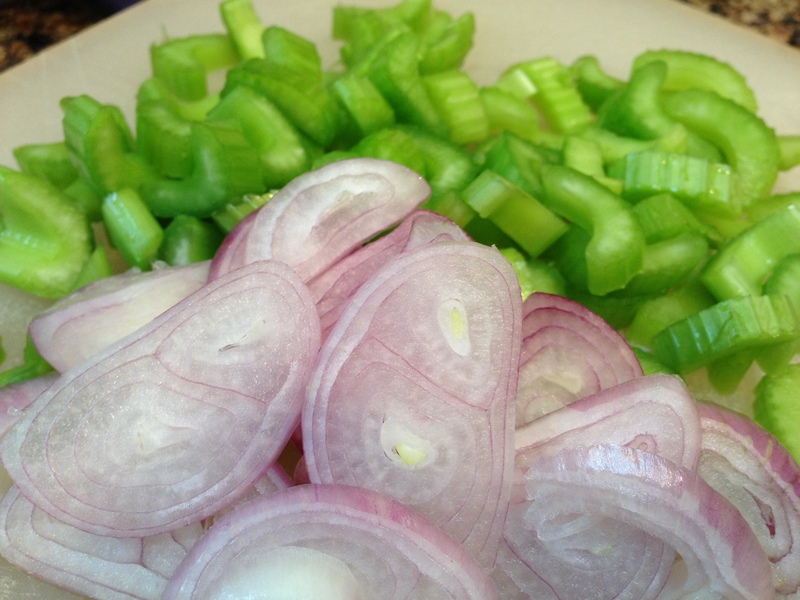 While that was working, I chopped up some aromatics (here are the celery and shallots) which I then sautéed in the same pan I used to sear the beef. I deglazed the pan with some water and apple cider vinegar, making sure I scraped up all the bits. Everything went back into the crock-pot and with the last sniff before the lid went on, I was pleased to smell a hug in the making. Later, I’ll add some French sliced green beans and adjust the seasoning. If it looks too soupy, I’ll tip the lid and let the broth evaporate a bit. That brings me to the last bit: presentation. Just about everything made in the crock-pot benefits from something added after the 10 hours you ignored it. So I’ll remove the beef and shred it. Then I’ll plate it with mashed root vegetables and top with some chopped Italian parsley. And if I was right, that I need to slow down long enough to make the holy trinity of cooking a part of this meal, it will nourish our bodies as well as our spirits as we gather around the dinner table, a meal the backdrop to our conversation about our day. These are the things I’m teaching my children. That every person needs 5 signature dishes that they can make that they know will not only turn out but turn out to be tasty like a hug from the inside. And that in order to make that happen, it is best to slow down and prepare for it and then present it with gusto. This entry was posted in cooking, Front Page, parenting, Recipes and tagged beef dishes, cooking, mirepoix, soffrito, umami by kristina. Bookmark the permalink. I’m a big fan of Judith Finlayson’s slow cooker cookbooks – not just because of the recipes, but HOW to use the recipes. A big thing for her is the pre-cook. Sauté the onions, the carrots, etc., together before putting them in the slow cooker, because the slow cooking process doesn’t do that for you. Missing that step largely causes the ‘this-is-ok-but’ meals that made me first quit the slow cooker. That’s it, really. That’s the thing between me and really eating well, that bone weary exhaustion. Slow cookers FTW! I had not heard of that trinity. I think it most likely will work well for writing and numerous other endeavors as well as cooking.